The Tranquility gown exudes timeless glamour. 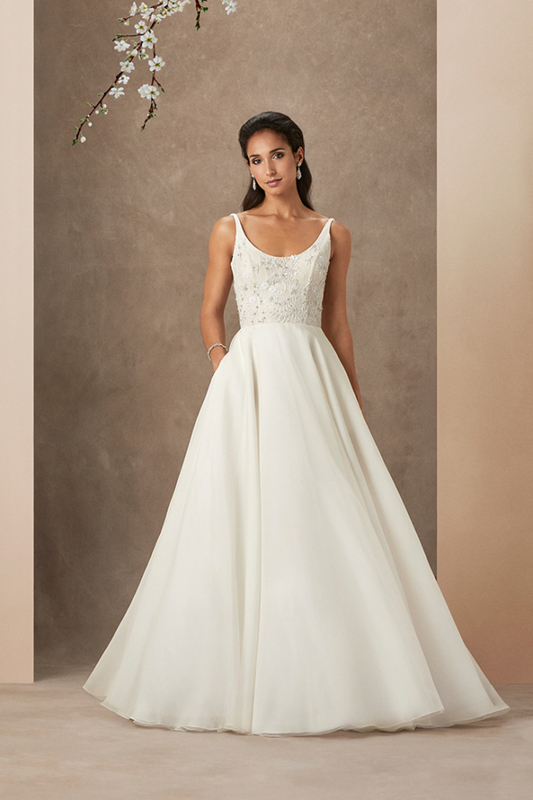 Cut in structured silk mikado, a plunging strapless sweetheart neckline features a transparent tulle inserted panel – to give the classic silhouette a modern update. The bodice is sculpted to the hip, with a drop in corset with boning and stretch panels. The fitted waist flares into a full A-line skirt with sweeping train, in ivory silk mikado over frilled net petticoats. The centre back bodice plunges to a V and silk-covered buttons and rouleau loops conceal an eyelet fastening.